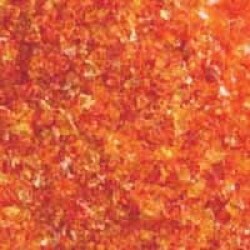 Orange Colored Smalts, Smaltz, Smalting or Osmalto is a time old tradition of making a long lasting textured Sign background by embeding aggregate smalt made fine pigmented glass or colored sands. Smaltings were most popular from 1865-1935. Originally Buildings exterior walls were coated with Smaltz from the second floor on up to extend the life of the paint job out 20-25 years. Eventually Smalts worked it's way up to the roof, and that's were we see Smalting on a mass with modern roofing tiles.